The third largest Island of the Mediterranean (after Sicily and Sardinia), Cyprus owns it popularity greatly to the mild and reliable climate with plenty of sunshine hours across all four seasons. The weather on Cyprus is determined by the location on the island; while the coastal area enjoys a mild Mediterranean climate, with little temperature amplitudes, the centre of Cyprus has semi-arid climate, with very high temperatures in the summer and periods of near-freezing point temperatures in the winter. Current weather in Larnaca by BBC. Tourists in Cyprus based on the coast, be it Larnaca, Paphos or Limassol, will be able to enjoy sun and pleasant weather throughout most of the year. See also: Sunshine hours in Cyprus (Paphos) – compared to London and Barcelona. In Nicosia, however, and especially in the Troodos Mountain range one should be prepared for changing weather conditions and equipped beyond flip flops and beach towel. See a map of Cyprus. For many visitors from northern Europe spring turns out to be the best time of the year to be in Cyprus. Warm, sunny weather and lack of tourist crowds are enhanced by the magnificent spectacle of colours the Cypriot nature has to offers, with its lush greenery and abundance of trees and plants in bloom. It is not without a reason the March is often called a ‘yellow month’ in Cyprus, as the island gets covered in blooming yellow wildflowers. The temperatures in March (between 13 and 18°C daytime) may still be a little bit below expectations for beach goers. In mid-April and for most of May it is usually possible to comfortably stay at the beach, as the temperatures exceed 20°C. From mid-April through May, the temperatures increase steadily in Cyprus and the island’s beaches fill up with locals and tourists soaking in the sun. The intense sunshine makes the average daytime temperatures in May feel more like a solid 24-25 degrees than the actual 21 degrees. Rain and sometimes tropical thunderstorms with hail are to be expected in April, but the weather gradually ‘dries out’ in anticipation of the upcoming summer. Starting from June the temperatures increase considerably in Cyprus, to some 27-30°C during the day and the comfortable 20-25°C at night. In July and August daytime temperatures above 30°C are common. The humidity in the coastal area is very high during the summer, which some visitors may find uncomfortable to the point of feeling an urge to hide in an air-conditioned room. The interior of the island feels less stuffy, so a trip into the beautiful Troodos Mountains may provide a much needed relief. It rarely ever rains in Cyprus in the summer. The average number of sunshine hours per day is impressive in Cyprus at 11.5 hours – more than in southern Spain, Portugal or even California. See weather chart for Larnaca, Cyprus. Where is the warmest in Cyprus? The southern coast of Cyprus is usually the hottest part of the islands. High temperatures are felt especially in the Limassol, Polis, Paphos, Pissouri, Coral Bay and in Larnaca (center). Ayia Napa, Nissi Beach and Fig Tree Beach in the southwestern part of the island are not as hot, yet offering still very pleasant weather conditions. See climate table for Ayia Napa, Cyprus. The island has an area of 3,572 square miles. See the map of Cyprus with the greatest sun exposure. While September is still very much a summer month in Cyprus, October and November bring a decrease of temperatures to…. about 20-25°C. If you do not expect tropical conditions during your holiday, during the day you will barely notice autumn arriving in Cyprus. At night the temperatures drop a little bit more, especially towards November. Rain becomes more frequent starting from September, although it is still possible to count on an average of 10 sunshine hours per day throughout most of the autumn season in Cyprus. Please note that after the hot summer, the water temperature remains almost as high as in July or August, at 24-26°C for most of September and October, which makes those months a great time for off-season holidays. After a long and hot summer season, the months of December and January can be surprisingly cold, with daytime temperatures often dropping to 10°C and even less in the mountainous interior, where snow is not unseen during the winter months. From mid-February the temperatures usually bounce back to the region of 18-20°C. 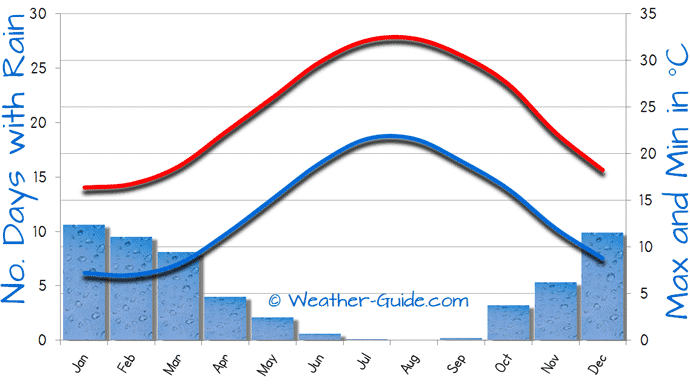 Rain is, however, very frequent, during the winter, being December by far the wettest month in Cyprus. Low-season holiday Cyprus. Autumn weather in Cyprus. When to visit Cyprus?